Last year I wrote two posts about my many visits to the Great Wall over the past 15 years. This year I have made another three visits to three different parts of the Great Wall – Huanghuacheng in April, Yumen in May, and Mutianyu just this week. My last trip was almost spur-of-the-moment. A TCK I met at a conference in Thailand in 2011 had a one day layover in Beijing; he contacted me a couple of weeks ago to ask what the airport was like – so I suggested he get a free transit visa and we could see a bit of Beijing. 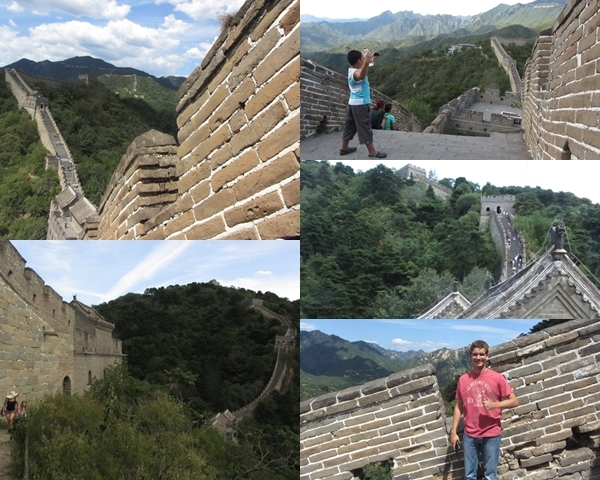 I picked him up at the airport on a gorgeous blue sky day and suggested we visit the Great Wall – a fun layover for him and a great excuse for me to make one last visit before I leave China. Mutianyu made a BIG change a month ago that took me by surprise! The road to up to the wall is closed to most vehicles – we had to stop at a new visitor centre, which has the ticket office, and a bus stop where tourists are ferried up the mountain to the wall. The bus costs 15 RMB round trip per person, but I’m pretty sure the ticket price for the cable cars has dropped which balances it out. The visitor centre has a wide boulevard lined by souvenir vendors – much less stressful than negotiating them on the slope up to the wall where they used to be. I found the jian bing lady I’ve stopped to talk to on previous visits and asked her what she thought about the changes. She wasn’t happy about being forced to leave her spot on the mountain, but knew there was nothing she could do about it. I told her that this would be my last visit (that I was moving away) and she was very sweet as she wished me well. And when we walked out a few hours later she called across to me, waving goodbye and sending hopes for safe travels and a return to China one day. I hadn’t been to Mutianyu in the summer since 2006 (also the last time I rode the toboggan down) so the bright green of the hillsides under the bright blue of the sky was extra amazing. At the furthest point I climbed to I stopped where an older woman was selling cold drinks she had carried up earlier in the day. I bought an ice-cold bottle of water from her and we chatted for a bit. I asked if she would mind if I took her photo (not something I normally do – inspired by HONY I suppose!) She put on her hat and joyfully struck poses for me – such a lovely moment! Then she offered to take a few photos of us together, which was very nice of her. I remember when Christina was leaving China for Cambodia more than 7 years ago, she talked about saying goodbye to places. It was something she’d read somewhere, and the idea stuck. We even took a half-mocking photo of her waving goodbye to a restaurant. 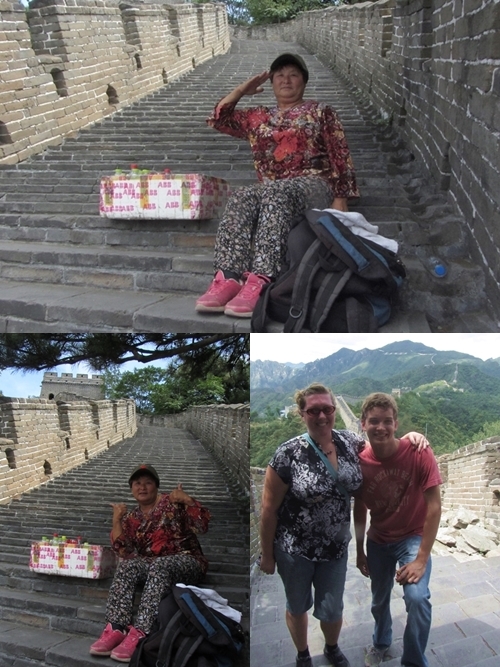 I thought about that as I sat on the wall and reflected on my seven visits to Mutianyu and the people they represent. I first visited Mutianyu in March 2004, a few weeks after I moved to China. A few months later in July 2004 I took my sisters there – our first real time spent together as three sisters without our parents. December 2004, a few days before leaving Beijing at the end of my year of study, I visited with Cathy and Kirill, and we climbed to the western end of the reconstruction. It was the first of two times I saw snow on the wall. In July 2006 my friend Nick was visiting me and our friends Amanda and Andrew and the four of us went there together; the boys and I climbed past the eastern end of the reconstruction. It would be another 6 years before I next visited Mutianyu. When Nick and Chloe got married in April 2012 I went to Mutianyu with a big group of their friends and family from around the world, including several close friends of mine. In March 2013 I went with a visiting group from the US, and an unseasonably late (and deep) snow covered everything – the only other time I saw snow on the wall. And then this week, in August 2014, I climbed Mutianyu one last time. I love that this last visit was with a TCK I met in Thailand years ago and hadn’t seen since. I love the reminder that this world can be small, and you never know who you will run into when. It’s a good thing to think on as I prepare to leave the place where I met many of the closest friends I’ve ever had.